I am so beyond excited to be going on my first work conference this week! I am heading to the "Motherland" as my co-workers and I call it. I work for Ford so we get to visit Detroit! I've never been there, so I am super happy to be going. Plus, I'll take an all expense paid trip any day for work! I have been searching for the best things to bring for the trip and I finally narrowed it down. I will only be in Michigan for 2 days, but by goodness I want to make a good impression! Folder of Important Paperwork // I have so many different pieces of paper that are crucial for this trip. I have to remember my badge, my plane tickets, my ticket to the conference, my car service receipt, etc. I hate to be disorganized so I have to have multiple copies and a nice folder to keep them in. Also, I have a notepad to take notes with. There's nothing worse than showing up unprepared to a work event! 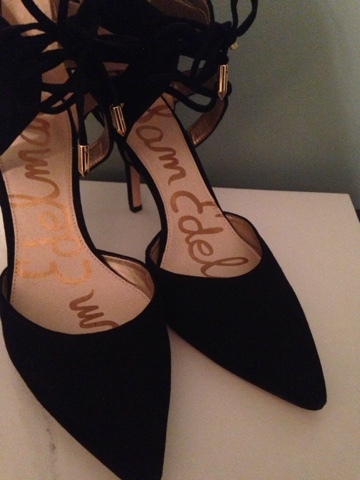 Pointy Toed Pumps // I love a good pair of pumps, especially when they have a pointed toe. I have two pairs I'm bringing to MI, because one can never wear the same pair two days in a row! The pointed toe really makes me feel confident and powerful at work. Lord knows I'll need it walking into a room of a thousand and sitting in a random assigned seat. I've packed my leopard ones and a pair of black ones. I've linked them below if you want to shop my picks! A Good Blazer // For any work conference, a blazer or really fab jacket is a must. Along with a really wonderful dress, a blazer adds the cherry on top to the look. I shopped all around Nashville this weekend and found a million different blazers ranging from totally different prices. If you know where to look, you can find some really wonderful pieces at great prices. My favorite shops are JCrew, Banana Republic, Target, and Belk. At any of these stores, you can find great work clothes, not just blazers. Chic Work Tote // Everyone knows the importance of a really great handbag. Well the same goes for a work bag. When carrying papers, my iPad, pens, notebook and lipstick I need a really great bag. My choice, Kate Spade always. The black bag I have looks so good with all my work outfits and I think it will be perfect for Detroit. Also, it makeshifts as a really nice travel bag. It holds everything I need and more. Packing for a work trip is so much fun, because you have a chance to dress up and meet some incredibly influential people in the company. I'm going to be having dinner with the CEO! Too cool! Also, coming up this week, Tyler and I leave for our one year anniversary trip! While we are gone, I'll be sharing a little special story about the two of us and a glimpse into our wedding day. I want to relive it, so I can't wait to write it!